NORTH CHARLESTON, S.C. - Despite trailing the Atlanta Gladiators (5-11-4-0) by two goals in the third period, the South Carolina Stingrays (13-11-0-0) came back to tie things up after two power play goals by Cam Askew and won the game 4-3 in overtime on a goal by Tad Kozun. 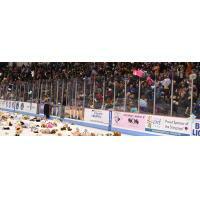 Forward Matt Pohlkamp scored in the final minute of the second period to bring 8,570 stuffed animals to the ice as part of the team's Teddy Bear Toss night, the most SC has ever had in its history with the event. Pohlkamp finished the contest with a goal and two assists to lead the way offensively for South Carolina, while captain Joey Leach had two assists and goaltender Parker Milner earned the win with 29 saves. The two teams were scoreless after one period of play, despite South Carolina having a 15-8 shots on goal advantage in the opening frame. Atlanta netted two goals at the start of the second period to take a commanding 2-0 advantage in the contest. Branden Troock potted the first tally at 1:48 of the middle frame, while defender Jake Flegel struck for the Gladiators at 3:29. In the final minute of the second, Pohlkamp sent the teddy bears to the ice with his sixth goal of the season, knocking home a rebound at the front of the net. Defenseman Cameron Bakker and forward Sam Fioretti earned assists on the Rays' first goal of the game that cut the Atlanta lead to 2-1. Troock scored his second goal of the game at 5:56 of the third to push Atlanta's edge back to 3-1. But Askew answered with back-to-back power play goals at 7:04 and 9:55 of the third to get South Carolina even in the contest at 3-3. Askew's first came on a re-direct in front of the net off a shot by Leach, before finding a loose rebound in front of the net off an initial shot by Andrew Cherniwchan. Pohlkamp had the second assist on both of the power play tallies. The game stayed even at 3-3 until the end of regulation. In overtime, Kozun scored the game-winner from Leach and Patrick Gaul at 1:35 of the extra session, driving to the front of the cage and potting a rebound off a backhander by Leach at the side of the net. South Carolina won the special teams battle in the game, scoring twice on the man-advantage and finishing 2-for-7 in the game on the power play. They also held Atlanta's PP unit, which came into the game ranked No. 1 in the ECHL, off the board at 0-for-6. Gladiators' goaltender Colton Phinney stopped 34 shots in the loss. South Carolina travels to Atlanta to complete their weekend of three games with a 3:05 p.m. contest on Sunday afternoon at the Infinite Energy Center. The Stingrays return home to once again battle the Gladiators on Wednesday night at 7:05 before hosting Greenville for Nickelodeon Night next Saturday, December 15. The game will feature specialty Double Dare jerseys!